The U.S. taketh away and then it giveth. After not renewing the contract for the Afghan air force’s C-27A cargo aircraft, the U.S. Air Force is looking into providing the Afghans C-130s, an Air Force spokesman says. It is not yet known whether the aircraft would be sold or given to the Afghans. “The U.S. Air Force is currently developing and assessing strategies to identify C-130 aircraft that could be made available for transfer to the Afghan Air Force at some point in the near future,” the spokesman said in an email. 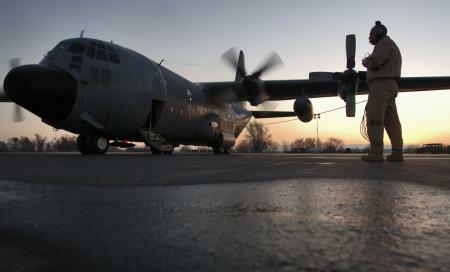 The Afghan government has requested four C-130s but the final size of the Afghan air force’s C-130 fleet has yet to be determined, the official said. The Air Force wants to deliver two C-130H aircraft to the Afghans late this year followed by two more aircraft before the end of 2014. In December, the Air Force told reporters that it would not renew its contract with Alenia Aermacchi for the Afghan air force’s C-27As because the company had not provided enough flyable aircraft. That means that the Afghan air force will lose 16 aircraft, or 15 percent of its total inventory. Dear sir, I am retired C-130 loadmaster instrutcor,air cargo observer instructor,air cargo specialaist with 4100.00 flying hours and coducted all types of missions.